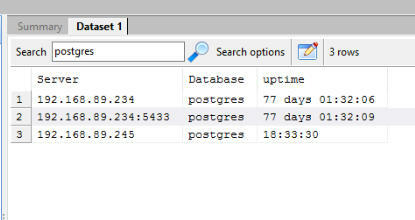 We have 3 different PostgreSQL servers (8.3, 9.3, and 9.6) we want to run scripts on. We first set up the connection details to the 3 servers. Let’s find out the PostgreSQL version of each of those servers. A simple script will be enough. We then run the project. 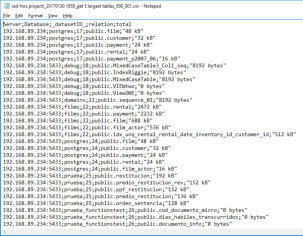 The consolidated results are displayed in an easy to read dataset. Now we want to find out the uptime of each server. We could create a new script to do this, or we could just use the multisql option in SQL Multi Select to do this. The results from our scripts. 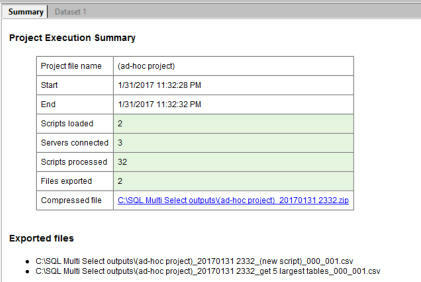 These 2 columns indicate the server and database the result was retrieved from. Run the project, and now we have 2 datasets - one displaying the server version, and another each server’s uptime. So far, you’ve seen how easy it is to run a script against multiple servers. 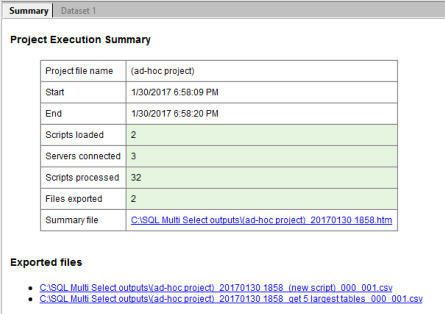 You can add additional scripts and servers to your project easily and have them all run in the same manner shown above. Now say we want to know the size of each database on each of the servers. First, we create a new group with the same 3 servers, but now choose to run the scripts on all databases on each server. 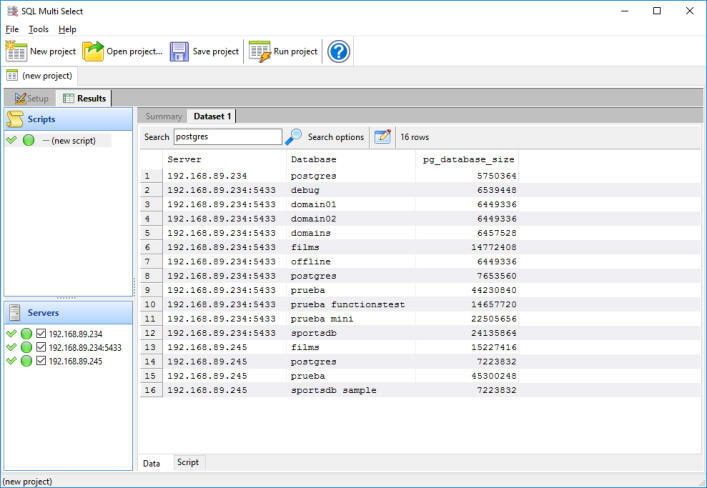 Add the script to retrieve each databases’ size. Run the project, and we’re done! The query group we defined earlier, containing our 3 servers. This is the script we will be running on all the 3 servers. Our 3 servers, and our scripts will only run on the connected database. The name of our query group, for easier identification. You can add additional servers as required. 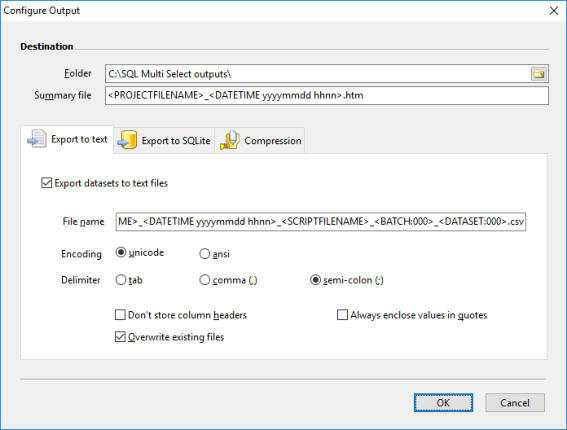 We’re retrieving 2 batches from a single script using the multisql option. 2 result sets are returned this time, one for each batch in the script. 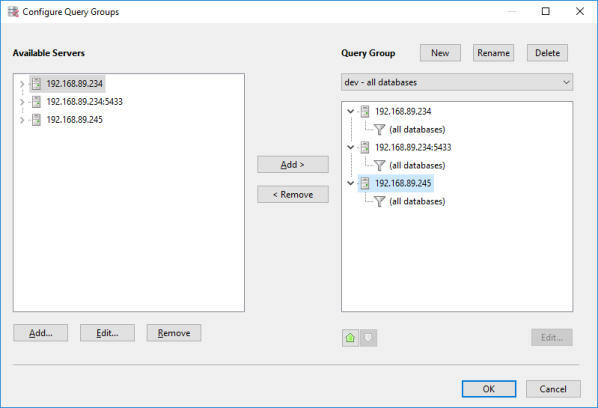 We created a new query group, to easily identify where our scripts will run. Our 3 servers again, but this time we choose to run the scripts on each database. 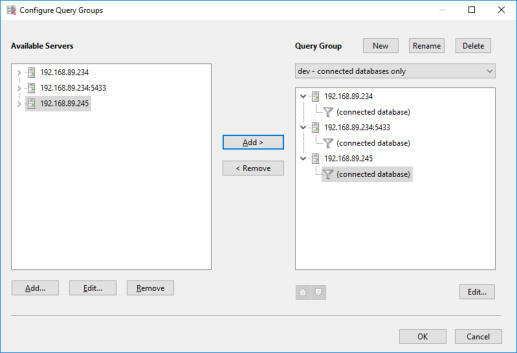 The query group we defined to connect to all databases on each server. We’ll use this script to retrieve each databases’ size. Let’s add another script to get the 5 largest tables in each database. 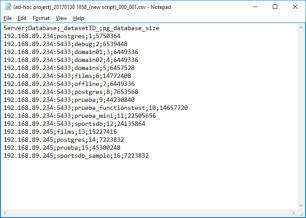 Our script has ran on every database on each server and retrieved the size. Run the project, and now we have 2 sets of result sets - one for the size of each database, and one for the 5 largest tables in each database. The contents of our file are automatically opened, allowing us to edit the script if required. We added an existing file that contains the script we want to use. 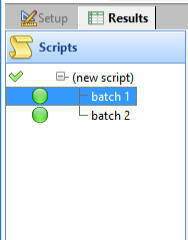 We want to store the results of the above scripts in text files. We set up the output settings to do that. Part of the result set returning the 5 largest tables in each database. 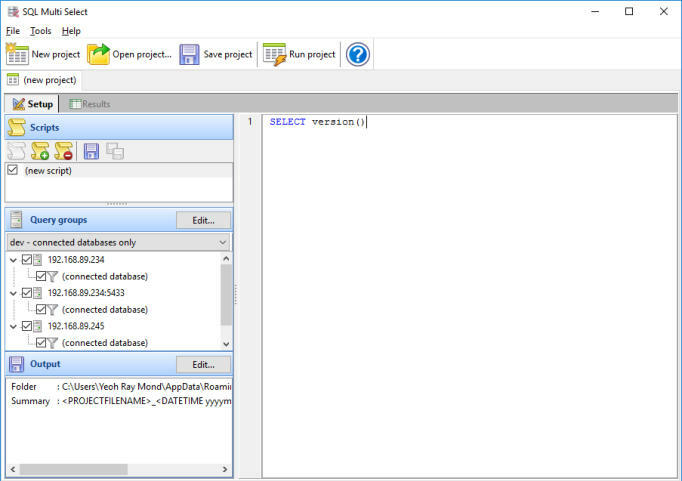 Run the project, and the consolidated result sets are now saved in text files. Select this option to export each result set to text files. Our text files will contain a timestamp in its name, together with other elements to help us identify the source of the data. Let’s take this 1 step further by compressing our exported text files. To do that, we’ll need to set up the compression settings. 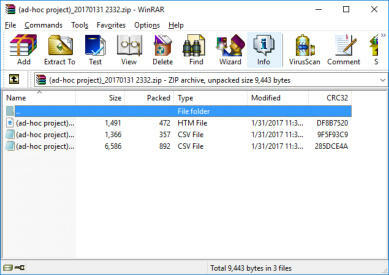 Run the project, and both text files are now compressed and stored in a zip archive. 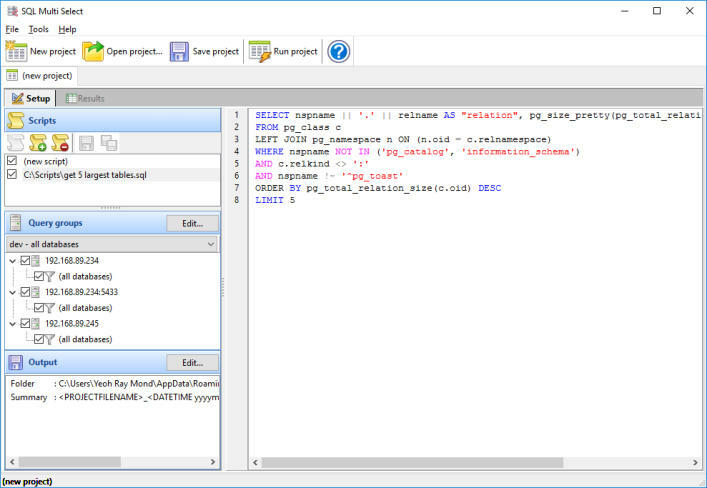 SQL Multi Select supports both zip and 7-zip archives. Our dynamically named file. 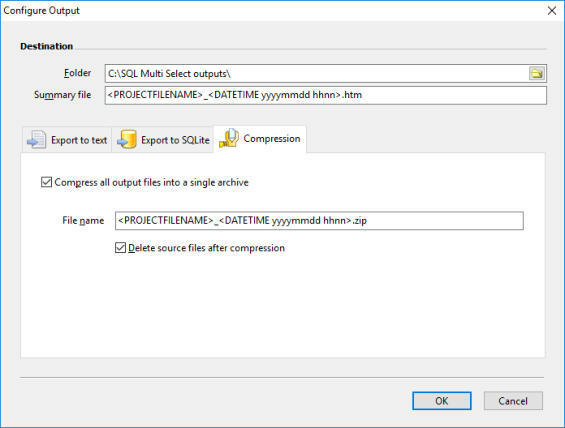 SQL Multi Select can create zip and 7-zip archives, depending on the file extension you provide. 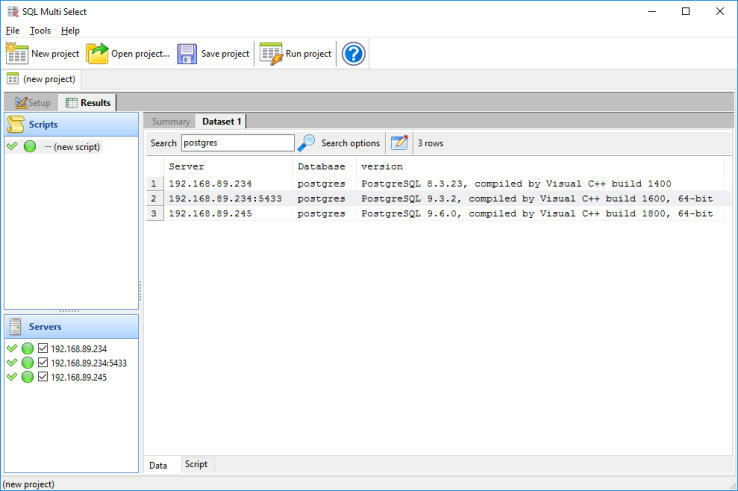 You can hide the results from one or more servers by unselecting the server in this list. Get the Basic Edition for FREE, download now. 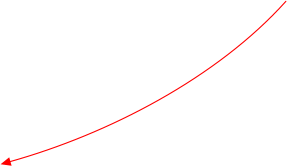 Compare the feature set between the FREE Basic Edition and the Standard Edition.